A ukulele is a 4-stringed musical instrument that is of Portuguese origin, especially Hawaii. They are very fairly easy to learn and play. However, the majority of ukulele players are right-handed. Therefore, most of the ukuleles on sale favor them more than left-handed players. The emphasis should not be on whether to play right-handed or left-handed, but rather, on picking the best ukulele to suit the needs of the player. Companies have come up with left-handed ukuleles to fix the issue of handedness. There are left-handed ukuleles available for soprano, concert, tenor and baritone sizes. The main advantage of being a lefty is the ease which you can learn from your right-handed teachers. 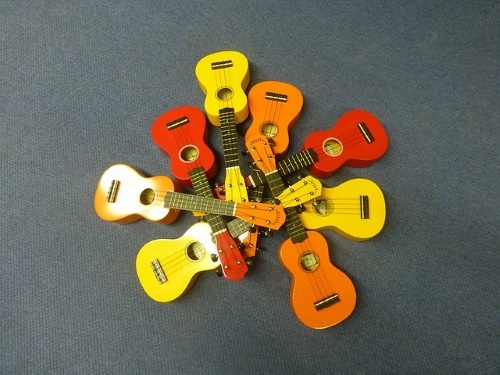 Ukuleles are very beautiful instruments that are fun to play and easy to learn. For left-handed players, choosing the first and best ukulele can be very challenging. Furthermore, buying the best left-handed ukulele is better than having to flip over or restring. 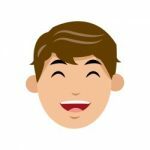 Therefore, we have carefully looked into many left-handed ukuleles and carefully picked out the ones that will be great for you. This left-handed ukulele has its body made with zebra wood, its fretboard and bridge made with rosewood, and its nut and saddle made with buffalo bone. It features 18 frets and 4 high-quality nylon Aquila strings. It is beautifully designed with an adjustable neck using an inserted truss rod that you can choose to tighten or loosen depending on the way you prefer your ukulele’s neck. This acoustic-electric musical instrument is electronically programmed to have a low battery indicator, a chromatic tuner that displays LCD color, and three controls of band EQ namely Bass, Middle, and Treble. Specifically designed to suit left-handed players, this ukulele is well strung and has a great feel and sound to it. 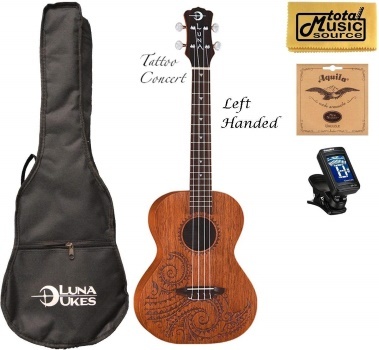 Definitely a nice ukulele with a great price tag. This left-handed ukulele has a beautiful mahogany body with a fretboard and bridge of rosewood material. This concert ukulele utilizes a tattoo laser etch having the Hawaiian culture in mind. Moreover, the fret markers on the top are also well patterned with shark teeth design. The beautiful design does nothing to undermine the excellent sound quality produced by 4 high-quality Aquila strings. Also, it is lightweight enough to travel with. It is great for beginners. Engraved into the body of this ukulele’s mahogany body is a traditional Hawaiian turtle pattern which represents endurance and longevity. . This left-handed ukulele is handcrafted with the top, back and sides made from mahogany, a bridge made of rosewood, and a perfect satin finish. The geared chrome tuners make tuning very easy and sustained. Specially for lefties, this quality ukulele has its Aloha on the right side up when people play it. Moreover, a white binding gives the ukulele a good balance and classic look. This inexpensive musical instrument is great for beginners and easy to learn new songs with. This ukulele is a delightful piece to hold and use, has a high-quality craftsmanship, and is quite durable. Despite its very simple and regular design, it offers left-handed beginners a very pleasurable, sweet and rich sound. This left-handed ukulele utilizes well-made Hawaiian koa back, top and sides. Its neck is of quality hardwood material and also has a morado fingerboard that is solid and durable. Moreover, the scale has a length of 17 inches and 20 smooth frets. The sound by this tenor ukulele is full, bright and loud. Furthermore, this instrument has an excellent construction that makes strumming easier. This simple-looking instrument will give excellent value for your money. This ukulele is truly beautiful and offers a great tone with well-balanced notes. It is gives moderate action and has well-spaced frets. This left-handed ukulele is the best for the price and a delight to play. This left-handed ukulele is a beauty to behold. With the use of its Aquila strings, it provides a voice that is very full and loud. It also features a graph tech NUBONE saddle to boost low and mid frequencies. Furthermore, the toning of this soprano ukulele is accurate because of the nickel frets. A quality bag is included to protect your beautiful transparent black ukulele from scratches or damage. Moreover, this simple musical instrument is very easy to learn which makes it perfect for beginners. This nice-looking ukulele is built with quality materials and a pretty finish. Moreover, the sound, construction, playability and price make this ukulele the perfect choice for left-handed beginners. Handedness is not a major factor for becoming a star. Though some people are ambidextrous by nature, many do things better with one hand than they do with the other. There are a lot of options available for left-handed beginners so it is important to pick an option that works best for you. Here are some of the things to consider. Learn to Play Right-Handed – You can train to become a right-handed player, especially as a beginner. If you practice this consistently, you may find out that you are quite comfortable being a lefty. However, do not force yourself to start playing right-handed if it is too inconvenient. 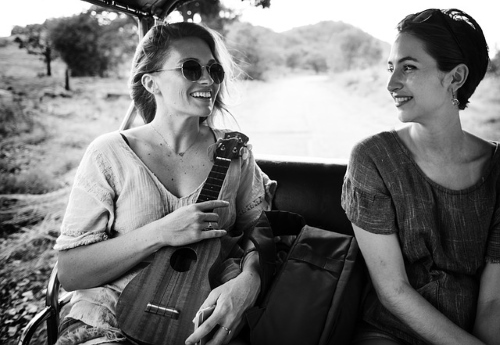 Flip Both the Ukulele and the Strings – This is done by turning the ukulele upside down in such a way that the neck will rest in your right hand while your left hand will do the strumming. You also have to flip the strings in reverse so that the G string will be placed at the top while the A string will be at the bottom. Restringing your ukulele will mean you have to mirror-image videos or chords before you rain. This option, however, will require reversing of the saddle and bridge. Flip the Ukulele, but Do Not Flip the Strings – This will enable the left-handed player to fret in the right hand and strum in the left without flipping the strings. If you can master this option, you will consequently be able to strum in reverse and play any right-handed ukulele y. Buy the Best Left-Handed Ukulele – These ukuleles are not very common and some may not be a true left-handed. Recently, however, there are still some nice and affordable left-handed ukuleles to choose from – even as a beginner. However, getting the best left-handed ukulele will get you playing right out of the box instead of going through the hassle of adjusting. In summary, being left-handed should not stop you from owning a Ukulele. Manufacturers have come up with ukuleles for left-handed players. While it may seem easy, getting the best left-handed ukulele can be quite tedious. With a lot to choose from, we have put together a list of some of the best, affordable ones. Therefore, we hope this list will help narrow down your search and provide you with a great ukulele.